2013 Was the Year of Black Twitter. There have always been ridiculous racial moments in American pop culture but before 2013, black folks went to places like Facebook to chat about foolishness like Miley Cyrus' sad attempt at dancing or Armani's misplaced love for Idris Elba. Now there is Black Twitter, where people of color from everywhere can weigh in on the latest tomfoolery with sarcastic, lightning speed and 140 characters. This level of sardonic, "it's funny because it could be true" jokes rolled on for the rest of the year (and will hopefully continue to do so). 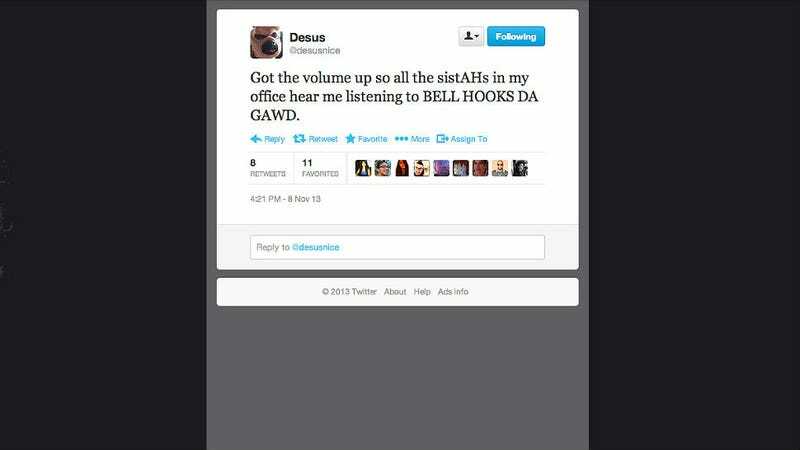 Complex counted down the biggest names on Black Twitter — and if you follow no one else, Erin and I suggest you add Desusnice. He is hilarious. Elsewhere, here's a countdown of the best Black Twitter moments. Enjoy.